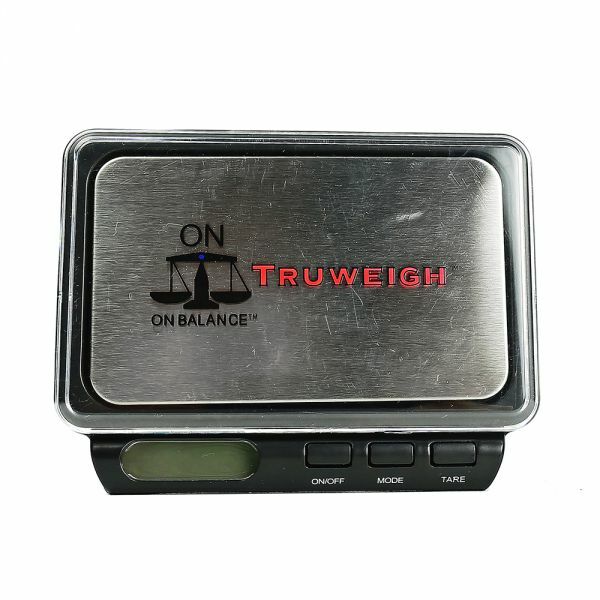 Built to be sturdy and accurate, the On Balance Truweigh Digital Scale is a great accessory for those who want reliability in a compact size. These scales have an accuracy of 0.01g and a 100g capacity making them great for weighing out small quantities in the kitchen. The removable lid can be used as a weighing tray and the display has an LCD backlit screen for easy reading. These scales also come with a handy faux leather pouch to keep it safe when it is stored away. With six different modes, an auto off setting and tare feature, the On Balance Truweigh Digital Scale is the perfect addition to any kitchen. These compact scales are available now for just £12.99, but if you are looking for a bigger set of scales then why not check out our full range of digital scales. HC004 Digital Scale by Head Chef is one of our best-selling digital scales and is accurate and affordable, perfect for when you need to weigh something out at a touch of a button. This pocket sized scale features an accuracy of 0.01 grams and can weigh up to 100 grams of weight. It also features a removable flip-top lid that can be used as a handy weighing tray. 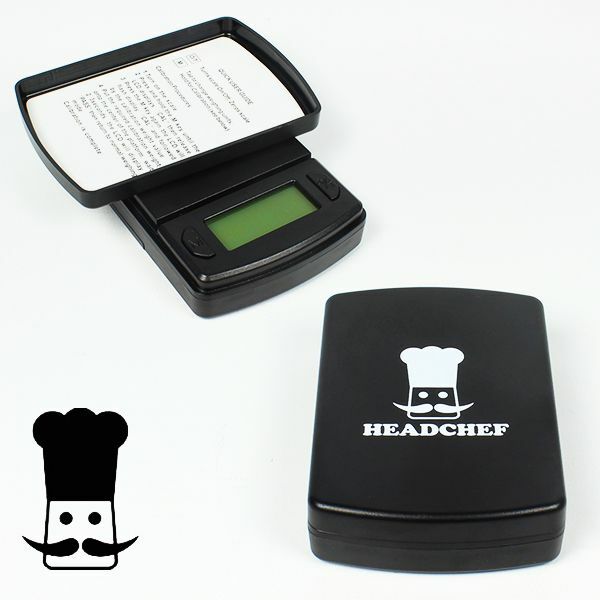 The Head Chef HC004 Digital Scale requires 2 x AAA batteries which are included in the box, meaning that you can start weighing straight away. Some of the other product features include, a stainless steel weighing platform, a backlit LCD screen so you can see it in low light situations, and an auto-off function for maximum battery efficiency. 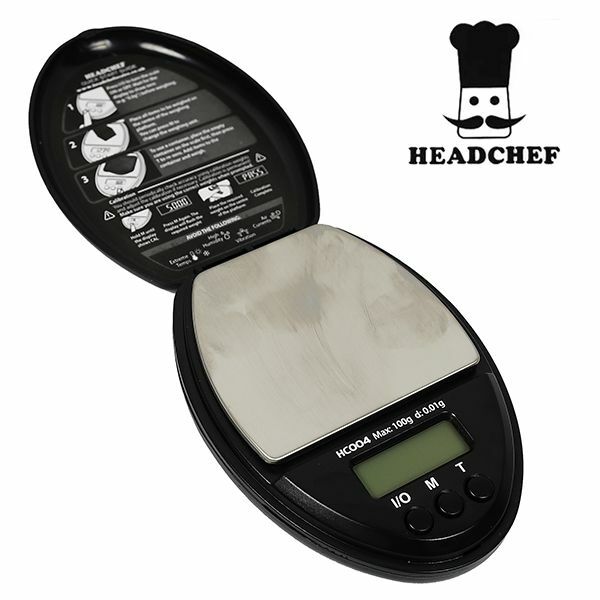 The Head Chef HC004 Digital Scale is available now for £18.99 and is the prefect addition to any kitchen. Thanks to the clever container and lid which gives the scales protection for discrete storage when not in use. The silicone container is flexible and when unfolded makes a perfect bowl, a feature missing from other scales, which holds the herbs, plant extracts, or ingredients for cooking, ideal also for checking the weight of herbal medications. The units of measurement are comprehensive and cover most requirements, these include: Grams, Ounces, Troy Ounces, Pennyweights, Carats and Grains. The units are always visible which is because the SPS 2oo has a backlit screen on the 61x19mm display. The scales provide the user with a “tare” function so the weight only of the material is displayed, without the need to first calculate the weight of the container being used. The scales have a built in overload protection, a power saving auto-off function to ensure that the batteries are not being wasted. The scales use two AAA batteries which we include in the offer price. 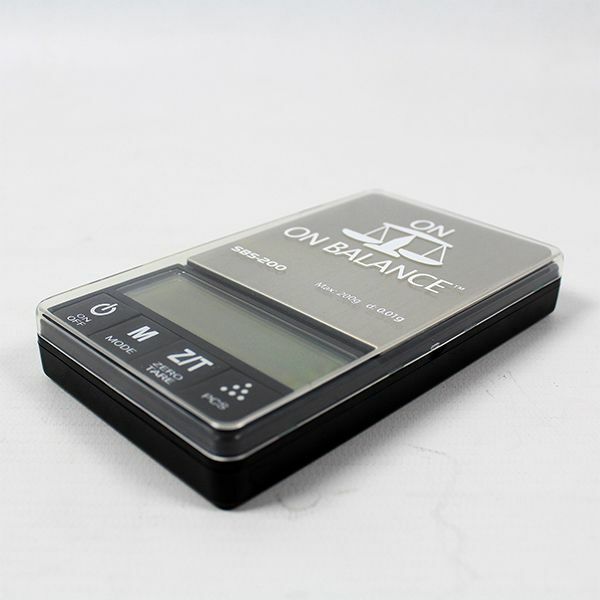 The On Balance digital weight has a scale of 0.01g and a maximum weight of 200g, and the scree in protected from accidental scratches and knocks by the transparent cover. Although the On Balance SBS 200 digital scales may be small at only 123 mm x 72 mm x 19 mm, don’t be fooled, these scales are super precise and can hold up to 200g in weight, perfect for anyone needing to weigh small quantities. It cannot seem so long ago that if we wanted to measure some herbs, spices or in the Californian “gold rush” the flakes of the precious metal that prospectors hoped would reward them for their long trek with horses and waggons across the continent. In those “heady” days the Assay offices would not have had today’s digital accurate scale, weights with balance scales would be the order of the day! How handy would the Head Chef HC002 scale have been to the prospector knowing that he could accurately know the true weight of his gold before he cashed it in? The scales weigh in at just 74g and are a handy pocket size at just 60mm (w) x 20mm (h) x 88mm (d), but don’t befouled by the small size, They have a capacity of 100g and weigh at an accuracy of 0.01g. The HC002 Scale has a useful back lit LCD screen, a choice of weights Grams, Ounces, Carat’s, Grains, Troy Ounce & Pennyweight, Tare/Calibration and Overload Protection and automatic shut-off. The scale works with the aid of two AAA batteries which we include in our price of £18.99, you will find these scales more convenient than mechanical or other traditional methods of weighing. We must give thanks to the march of progress and the never ending quest for technological advance for these high precision scales from Tanita. No longer do we have to weigh products using a balance scale with clumsy brass weights that had to be certified in case some unscrupulous person shaved part of them away. 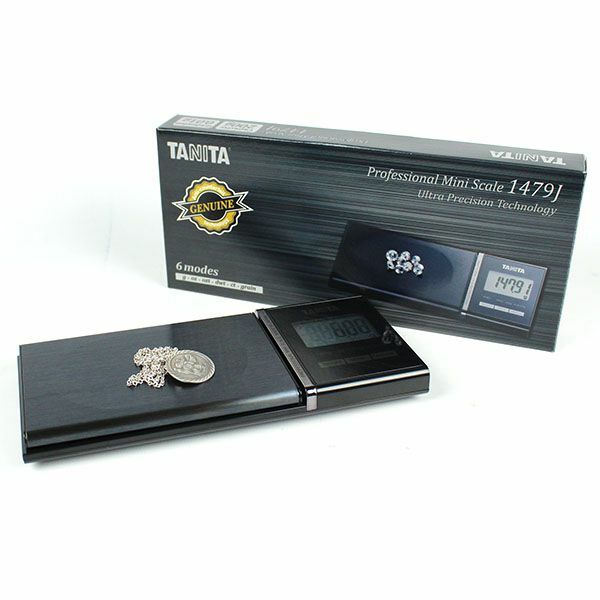 The Tanita 1479J digital scales which are sold by us feature genuine anti-counterfeit technology, they are not look alike copies, and they are made by the company themselves in Japan. 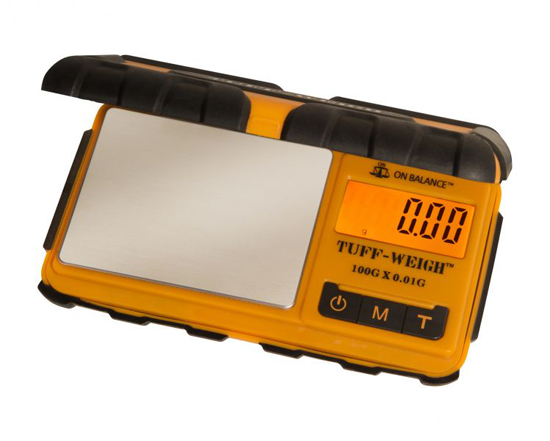 The scales are truly portable and are easily carried in a pocket or bag, they feature a black oxide film coated stainless steel tray, reverse blue backlit display for easy visibility, calibration button, tare button, and 6 different modes of measurement. You can choose from Gram, Ounce, Carat, Troy Ounce, Penny Weight, and Grain, true professional accuracy is guaranteed from 0.01 grams to a maximum capacity of 200 grams. Full instructions are provided with the Tanita 1479K scales along with 2 x LR-44 Batteries 1 x Neoprene Protective Pouch and for £89.99 you can join the professionals. There is an expression “never send a boy to do a man’s job” and that could apply to the TUF-100 On Balance scales which will take just about everything that could be thrown at them, but still weigh out herbs and spices simply and accurately. You can choose from the six weighing modes including grams, ounces, troy ounces, pennyweights, carats and grains. The detachable lid on which items are placed to be weighed can be conveniently used as a tray and the inner case which is hard orange plastic and includes rubber grips.it also features a conveniently large 14mm digital display shown against a bright orange background. The scales are powered by 2AA size batteries and we include this with your order, the scales are a handy size 142mm x 77mm x 22mm, the rubberised casing will ensure that it can stand up to knocks as also give a good grip too. The robustness of the scale means that the manufacturers can offer a 3 year guarantee and we can confidently say that the scales will continue to work each and every time you need them. Currently we are offering the scale in a green finish and a limited edition in black. At last we can bring you a set of scales which are not only truly accurate, but are rugged and will stand up to just about most things that can be thrown at them. The scale will weigh items up to a maximum of 400 grams, so just perfect for those culinary excursions into the kitchen. The scales are also ideal for more delicate operations as they measure in increments of just 0.01 gram, so light you imagine that it would be virtually impossible to record. The Triton T3 Digital Scale will weigh in a number of units; grams, ounces, dwt, troy ounces, grains, and carats, something there for everyone! 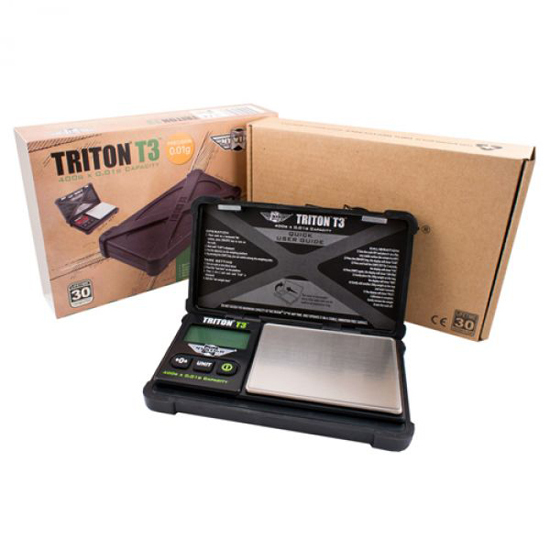 There are two features which have to make the Triton T3 the toughest digital pocket-size scale in the world, the scales feature a durable, rubber, padded outer case and shock mounted internal components, so a great product if you happen to be in the habit of dropping items. The Triton T3 is a rugged high capacity scale designed to take the impact of every day wear and tear in its stride. It includes the two AAA batteries which operate the scales, a removable protective cover that doubles as an expansion tray, a backlit display and a 30-year warranty; the Titan T3 is offered by us at just £29.99. This is a great new product from On Balance, this digital scale will take on the toughest of jobs and it is crammed full of features too. With an orange hard plastic case with rubber grips, extra-large 14mm display digits against a bright orange backlight. It has six weighing modes and you can choose from grams, ounces, troy ounces, pennyweights, carats and grains the items being placed on the 76 x 59mm stainless steel tray and it has a capacity of 100grams in 0.01 gram resolution. Selectable auto-off allows you to change the auto-off time to suit your needs and the detachable lid doubles as a tray. Powered by Powered by 2 AA Batteries, which we include, the dimension of these scales is 142mm x 77mm x 22mm the unique design featuring a rubberised protective casing, offers an extra layer of protection as well as superior grip over most other scales on the market. Tuff Weigh pocket scales were built tough and they are offered with a 3 year manufacturer’s warranty; you can sleep easy knowing these scales will carry on weighing whenever you need them. When it comes to scales we have it covered here at Shiva. Whether you’re looking for high-tech digital scales, or traditional analogue scales. We offer a wide range of digital scale here at Shiver, from simple and compact digital scales to multi-function scales, something to suit your needs. Choose from great brands such as On Balance, Tanita, Champion and Truweigh. Our digital scales fit a range of budgets and come in a range of sizes ideal if you’re strapped for cash or strapped for space. Digital scales measure pass and provide a digital number on the screen. It uses modern sensory technology and computer calculating for an accurate and reliable reading. Digital scales are quick and easy to use and feature in many kitchens. 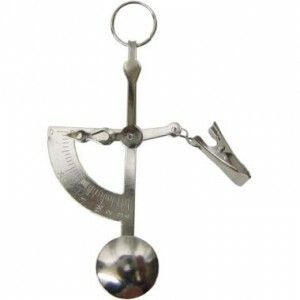 They tend to be more convenient to use, than mechanical scales or other traditional forms of weighing. Some of the scales we offer do have maximum weights they are able to take so you should bear this in mind when ordering. These have a long history, first used around the 1600’s for measuring produce on the go, with traders. They were also used during the gold rush in the UAS in the 1800’s so your weight in gold could quickly and easily be counted. Quick and easy to use, these pocket scales are made so you can carry them on you. You can easily get an accurate reading from the Pocket Scales we stock at Shiva. They are ideal if you like the old school element and want to shy away from digital options. You can easily weigh your items by holding the ring at the top, and attached the item you need to weigh to the clip. The pointed indicator will then move, showing you the weight. The useful items make great gifts as well, for anyone how likes gadgets and gizmos. 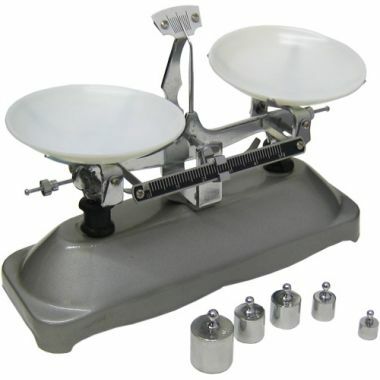 Chinese Pan Scales or balance scales are a traditional way to weigh your items. Weights are determined by balancing out the scales. This method of weighing was the first mass measuring instrument. Popular for centuries, before mechanical scales became common in the early eighteenth century before moving onto digital scales, which is what many people now prefer to use. For those who like history or just prefer traditional weighing methods, Chinese Pan Scales are a great option, not only are they accurate, but they are also a great display piece which would look great in any kitchen. Simple to use, all you need to do is put the item you want weighing on one pan and add weights to the other until the beam balances out. You can also set the weight first and add to the other pan if you want a specific weight. 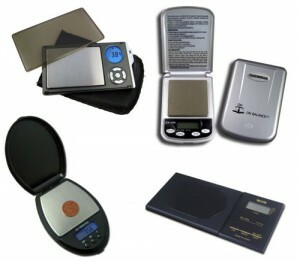 With the Chinese Pan Scales from Shiva, you get a wonderful durable product, it comes with weights of 5g / 10g / 20g (x2) / 50g. The Rad Touch Screen Scales can weigh up to 350 grams in increments of 0.1 gram and require 2xAAA batteries which are included. The flip top lid means that the plate is protected against any accidents and the scales also come with a handy leather carry pouch for when there not in use. The Rad Touch Screen Scales are available now for £29.99 and will make a great addition to any kitchen.